If I had a pound for every time a mum told me that her baby hates tummy time, I’d treat myself to a night away in a hotel so I could have a full night’s sleep! But seriously, all babies start off hating tummy time. Why would you want to be put on the floor on your belly when you could be curled up on mummy’s warm chest in the fœtal position? A bit of background: back in the eighties it was recommended that babies be put to sleep on their tummies but it was discovered in the early nineties that this was the leading cause of SIDS so the advice became to put babies to sleep on their back. This excellent article from The Guardian talks about how Peter Fleming’s research meant the rate of cot death diminished substantially. It’s well worth a read. Babies sleep a hell of a lot even at five months old, so all of this time on their back was having a detrimental effect on how quickly their neck muscles were developing and so tummy time was encouraged by Health Visitors so that baby could get the exercise needed to strengthen their necks. And why is this so important? Well, if we want babies to be able to support their own heads, sit unsupported, crawl and eventually walk, then developing these neck muscles is an absolute must. The NHS and Health Visitors recommend you do some sort of tummy time with baby from week 1. I can guarantee if you put your baby down on the floor on his belly at one week old, he is just gonna face plant the carpet and who on earth is going to a) enjoy that and b) want to do it ever again? 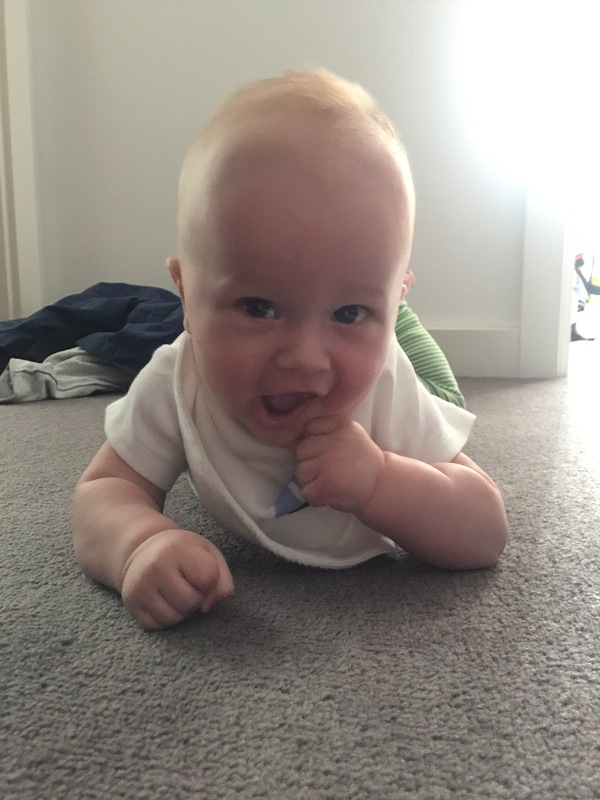 When Dexter turned three months old he despised tummy time. 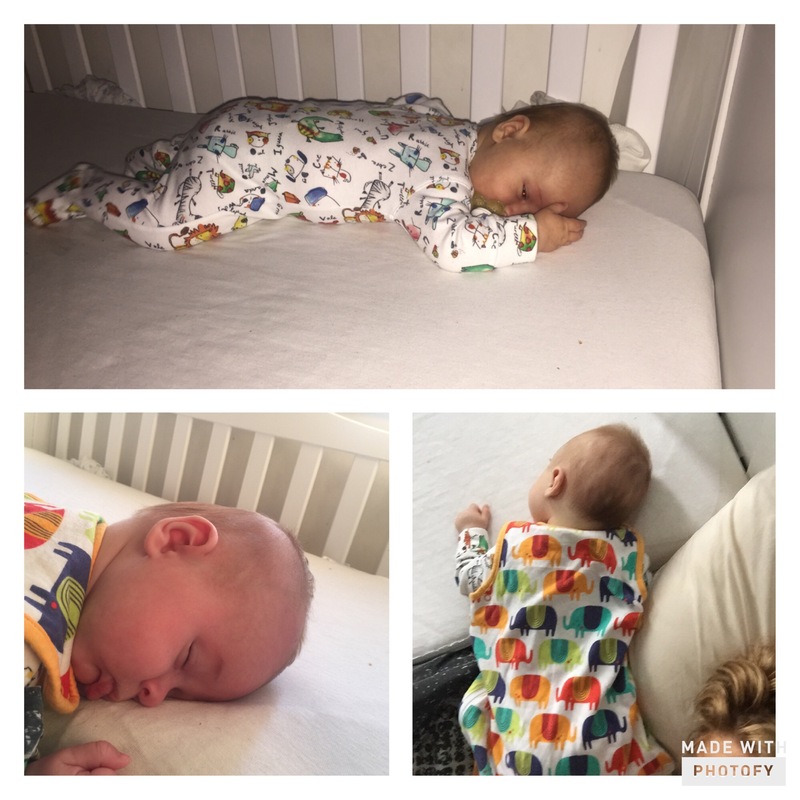 I’ll be honest, I hadn’t encouraged it much because his neck had always been strong from birth and he was already rolling over in his cot from back to front, plus every time I had put him down he had screamed blue murder and I didn’t want to force it. However, it was seriously doing my head in that in the middle of the night he would roll onto his front and be unable to get back over and then would wake me up crying, and also I was scared he would face plant the mattress and be unable to breathe. I decided action must be taken! To begin with, I ensured that we always practised tummy time straight after waking up from a nap. This meant there was no danger of him being overtired and me being confused by whether he was upset over tiredness or the fact I had plonked him down on his belly. Secondly, I started with very small amounts of time, the first week we did five minutes and the next week ten, building it up to thirty minutes at a time. Thirdly, I made sure that as soon as he got upset that I immediately stopped what we were doing and tried something else. I did not want to run the risk of him associating tummy time with being upset. To help him be more comfortable I placed him on the floor in our hall way which is long and narrow and I got down opposite him becoming his mirror image. When you get down to their level like this, they suddenly stop feeling so afraid. I would show him how I could push up on my hands and do mini press ups and show him how I could roll. The second day he rolled after he watched me do it. It was a massive fluke of course because he didn’t do it again for another week or so, but at that moment he had just been able to copy me perfectly. The amount of time he was able to do on the floor grew and grew. 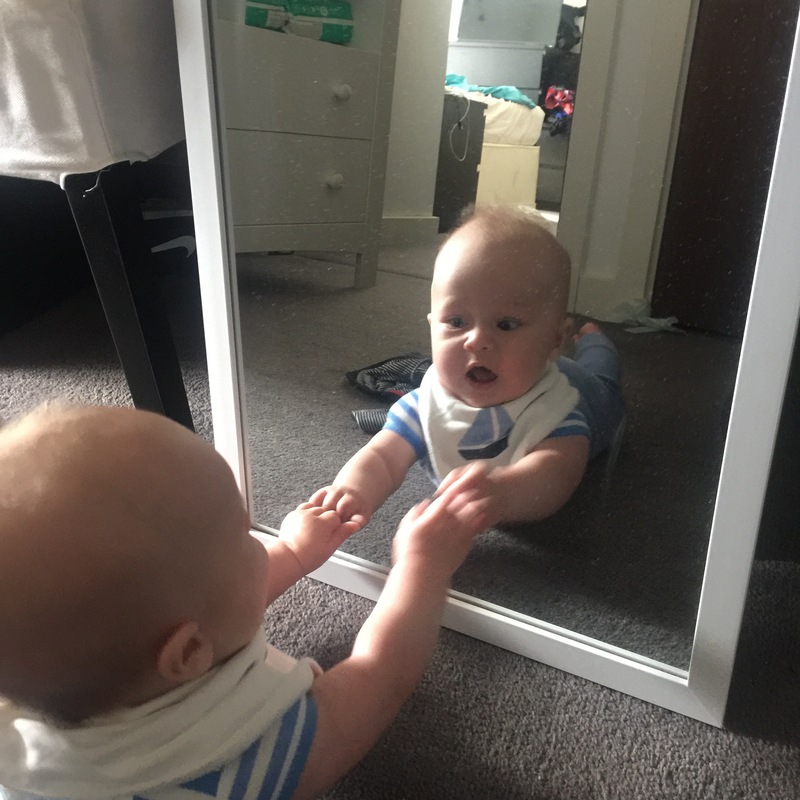 The second week I introduced a mirror and placed it in front of him so he could see himself. This kept him entertained for over ten minutes as he tried to bat at the baby in the glass. I started introducing toys on the third week to encourage him to roll by getting him to follow them with his head. I experimented with different toys, some stimulated him too much and he would end up in tears, some he absolutely adored, including his multi coloured ball which he would lunge at and bat towards me. Once I found this toy worked the best, he started being able to cope with twenty minutes plus each time on the floor and he started rolling when he tried to reach for it. The first few rolls are a massive shock to their system. Traditionally, babies roll from front to back first and then learn how to roll from back to front. Dexter did it the other way around! He was quite happy to throw his legs in the air and gain the momentum to propel himself onto his side and then onto his front, it was a skill and it was very deliberate. It’s different when you are on your front reaching for something and then suddenly you roll onto your back with a bit of a thud. Expect crying and a look of horror. They soon realise how fun it is though! Fast forward to four months old, so literally one month after starting to do tummy time on a regular basis, and this baby no longer wants to be on his back! He has gone from a screaming Tummy Time hater to a baby who rolls onto his stomach the second he is placed on the floor. He rolls onto his front in his cot and then again to get into my bed, then once more to be back on his front! There is no stopping him now! Place tiny newborn babies on your chest in the tummy time position, they will try to lift their necks to look at your face but if they don’t they are safely nestled in your chest- plus it’s a good excuse for skin to skin. This is all you need to do for the first few weeks. When they are over a month old invest in a soft plush playmat. Ours came from Mamas and Papas and only cost £30ish. I would place it on our bed and gently put Dexter on his front. He could just about muster the strength to turn his head from side to side and if he suddenly dropped his head I knew it was okay because the mat was so soft. 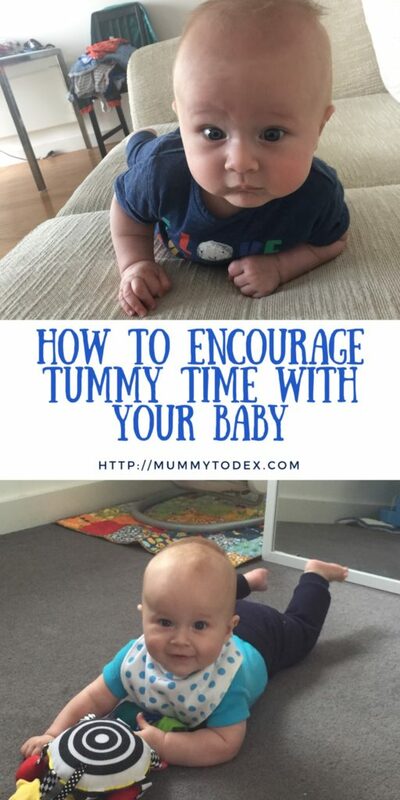 Practise tummy time on an exercise ball or a pillow. I didn’t use an exercise ball but this looked like a great way of getting them used to being on their tummy without the solidness of a floor. A pillow props them up before they are able to with their own arms and makes it nicer for them. 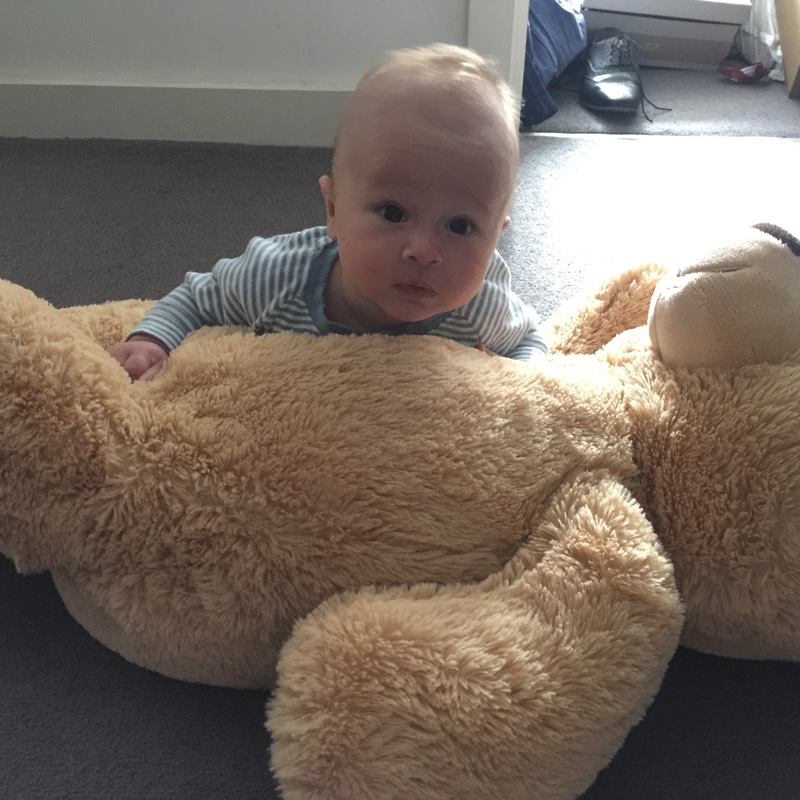 We own a giant bear I bought from Home Bargains and we would prop Dexter up on the legs so he could see what was going on around him. Putting a mirror in front of them really entertains them, they don’t realise who it is in the mirror but they love it anyway! Clear plenty of space for when you do this activity, baby can roll at any moment and you don’t want him crashing into a wall. Get down on the floor with them at their level so they can see it’s not so scary after all. If and when they roll, give lots of kisses and cuddles so they know what a fantastic job they just did, they will then be encouraged to do it again. 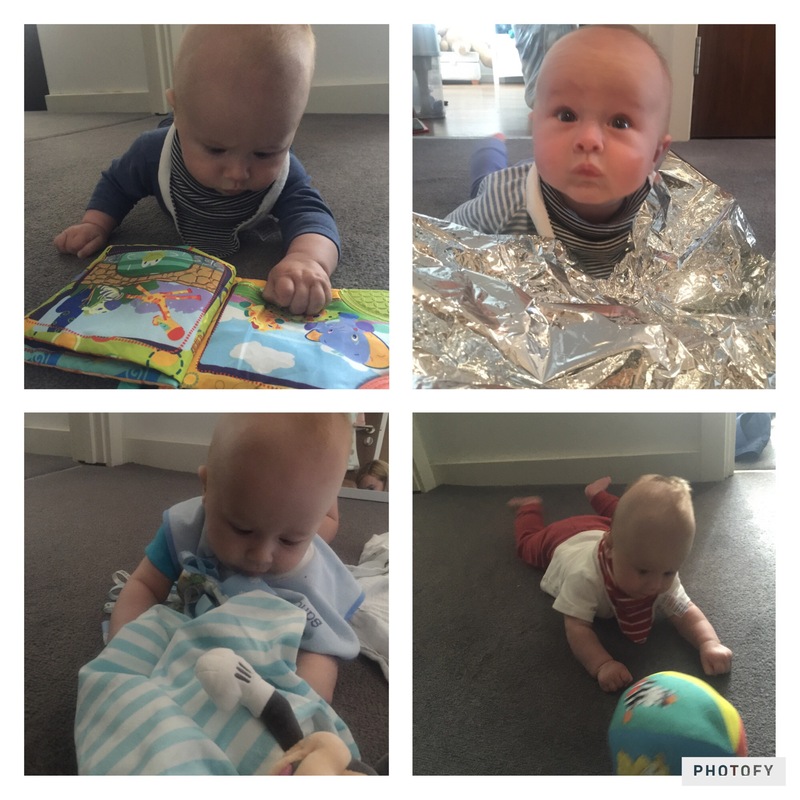 I wish you’d written this article when I was struggling with tummy time with my little one! She seemed to find it difficult and at that stage I was worried she’d never get there. (She did). Lots of great tips, particularly using the mirror!